With all the snow that has fallen this winter, the conditions are ideal to put on your snowshoes and go on an adventure. For beginners, finding the right model among all those available on the market can be a little complicated. Especially that the models offered nowadays are highly specialized.You can leave the huge wooden babiche classics behind because snowshoes have developed greatly from the technical point of view and specialize according to a specific type of activity. For a beginner, the choice can be overwhelming, but with the right pair of snowshoes, your experience will be more pleasant, no matter which snowy path you walk. The very principle of a snowshoe is simple: spread your weight over a wider area to “float” on the snow without pushing yourself down. There are, however, several types of snowshoes and it is important to decide how you will use them before setting your sights on a particular model. Do you want snowshoes to climb snow-capped peaks, run on a trail, or simply walk in the forest on a winter afternoon? For a leisurely stroll at the cottage or at the nearest park, no need for an ultra-specialized crampon model. This category includes snowshoes for hiking on flat or hilly terrain. Perfect for beginners or those who will only put them on occasion, these models are particularly accessible, both in terms of price and use. Their traction system is limited but enough to allow you to climb some slopes. For the off-piste enthusiasts or adventurers ready to face a mountainous or rugged terrain, these are specific snowshoes you need! Designed to maximize grip in difficult terrain, they are rugged and can be combined with warm winter technical boots. Endowed with a host of finely tuned technical elements, they are perfect for tackling icy and steep terrain. While the majority of all-mountain snowshoes have impressive front and rear cleats, some models even have a second set of side teeth to provide even more bite. Finally, all-mountain mountain snowshoes are often lighter than others so you can wear them over long distances without exhausting yourself. Are you a fan of running? When the ground is covered with snow, add ease to your daily running routine and just add snowshoes! Quickly gaining popularity in Eastern Canada, snowshoeing requires specific equipment. Suitable for flat or groomed terrain, snowshoes for running offer less flotation. Short, narrow and asymmetrically shaped, they are designed to allow a fast and smooth stride. Tubular Frame: These traditional frames use aluminum tubes and a synthetic fabric bridge. Durable and lightweight, this type of frame is found on hiking or mountain snowshoes. Flat Frame: Also made of metal, these flat frames (found mainly on MSR models) are lined with a row of well-cut teeth that increase the grip of snowshoes in icy terrain. Molded plastic: affordable and durable, plastic is a versatile and practical material, albeit rigid and a little more slippery. 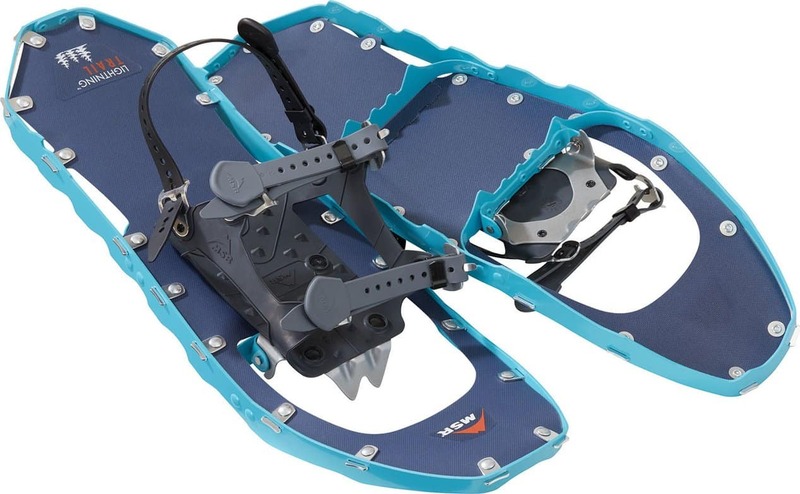 The vast majority of snowshoes will be equipped with crampons to ensure stability on ice and slopes. These are usually found in the front of the foot, sometimes accompanied by another series located at the back of the snowshoe. The models intended for the high mountain travel also very often have a row of additional crampons, skirting the frame. From harness to ratchet strap, plastic to rubber, there are many fastening systems which can make all the difference between the model we love and the one we just think is “okay”. It is especially important to think about which pair of boots you will be wearing for snowshoeing. If you plan to go off-piste with your snowboard, for example, make sure the bindings are wide enough to accommodate your boots. In this respect, the majority of snowshoes designed for the high mountains have wider and more resistant bindings. On the contrary, bindings of running or racing snowshoes are designed to be paired with lighter shoes. 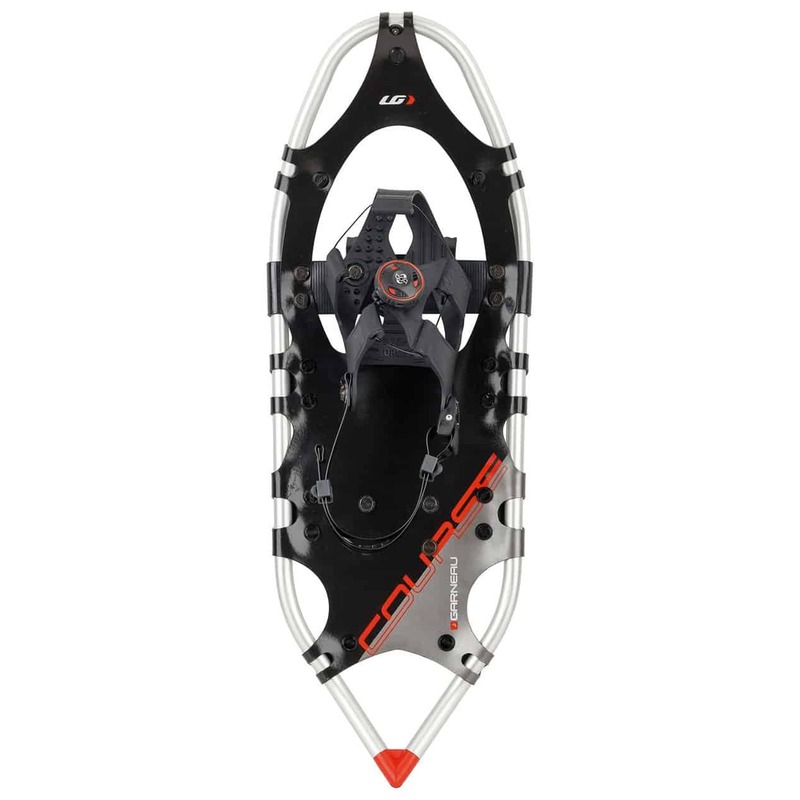 Fixed rotation system: With flexible straps attached to the frame, this system ensures that the back of the snowshoe lifts a very little amount during the stride. Although the system raises a lot of snow, it helps to better absorb shocks and to make precise steps. It is, therefore, a perfect system for running or hiking snowshoes. Articulated rotation system: Equipped with a pivot located at the front of the foot, this system makes it possible to tackle deep snow and rough terrain. It is usually found on all-mountain snowshoes. Very common on all-mountain snowshoes, the climbing wedge is a metal rod located at the back of the foot and can be raised if necessary. It supports the heel and provides better grip on steep terrain, in addition to reducing fatigue in the legs. Those who venture off the beaten track on terrain covered with a thick coat of snow, using an extension on your snowshoes will add ease. Clinging to the back of your snowshoes, they increase the flotation surface and help you advance in deep snow. The extensions are also practical to support the additional weight of your equipment during long days of snowshoeing. Each extension model, however, is not compatible with all snowshoes, so it is important to check if this is the case beforehand! The narrow snowshoes (about 20 cm wide) are designed for the fluidity of movement (race or running snowshoes, etc.) and are best used for the flat or groomed paths. Larger snowshoes (about 25 cm wide) provide better flotation for walking in deep snow. For the length, everything depends on you. In fact, the length of a snowshoe is directly related to your weight. The heavier you are, the wider the racket will be to keep you on the snow. By taking a look at the snowshoe models available on the market, you will quickly realize that many say “for men” or “for women.” This is an important detail to consider because it is simply related to the size of the snowshoe. Women’s models are shorter and have a narrower frame to make stride easier. Also, they have narrower bindings, suitable for small feet. Take out your snowshoes and enjoy the winter with your family! To allow young and old to enjoy fresh air and pristine snow, there are snowshoe models suitable for the little ones. More affordable, but just as rugged, they are perfect for effortlessly introducing the little ones to your favorite winter activity.